2014 Kids Choice Awards Photos, News, and Videos | Just Jared Jr.
It’s time for the last post of the 2014 Kids’ Choice Awards — the Best Dressed Poll! JJJ staffers have went through all the stars on the orange carpet, backstage and audience and we’ve finally picked out our faves. We have 10 this year! Be sure to check out all our coverage on the awards, too — complete with a winners list, our Gif Booth, and own voting poll results! The stars of the upcoming film Earth to Echo take JJJ along for the ride in this exclusive video from the 2014 Kids’ Choice Awards! The actors – Astro, Teo Halm, Reese Hartwig, and Ella Wahlestedt – give us a behind-the-scenes peek at everything from getting ready, to hitting the red carpet, and more. Check out the video, courtesy of our pals over at KIIS-FM, below! Earth to Echo his theaters this summer and tells the story of a group of young friends who begin to receive bizarre encrypted messages on their cellphones. They then embark on an incredible adventure to discover the meaning behind these communications. For more info on the film, be sure to follow @EarthtoEcho on Twitter! Piper Curda is darling in a dotted dress at the 2014 Kids’ Choice Awards held at USC Galen Center in Los Angeles on Saturday afternoon (March 29). The I Didn’t Do It actress was joined by co-stars Sarah Gilman and Peyton Clark, plus Noah Munck, and Billy Unger. Also spotted on the carpet: Degrassi cast members Melinda Shankar, Luke Bilyk and Demetrius Joyette, plus the entire cast of Every Witch Way! Claudia Lee steps out in style for the 2014 Kids’ Choice Awards held at USC Galen Center in Los Angeles on Saturday afternoon (March 29). The 17-year-old Surviving Jack actress walked along with BFF Bella Thorne and even hit up our JJJ Gif Booth! Also spotted on the carpet: Every Witch Way‘s Kendall Ryan Sanders with singer Bryce Hitchcock. “Let’s just take in the fact that I sat two rows away from the Robertsons at the #KCA2014. @williebosshog @bosshogswife @sadierob,” Kendall wrote on Twitter after the show. Nice! 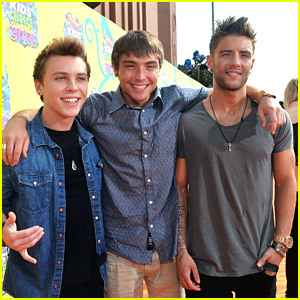 Emblem3 walk the orange carpet at the 2014 Kids’ Choice Awards held at USC Galen Center in Los Angeles on Saturday afternoon (March 29). The guys — Drew Chadwick and brothers Keaton and Wesley Stromberg — stopped by the show before jetting out of the country for some shows in England. “On our way to the UK!! !” Wesley excitedly tweeted. He also shared one of the best #KCAselfie’s from the carpet too: “Most epic selfie from the #KCAs2014 yesterday ! Haha @DavidHasselhoff #KCAselfie”. Mia Talerico goes cute and cool on the orange carpet in a tutu and hot pink boots at the 2014 Kids’ Choice Awards held at USC Galen Center in Los Angeles on Saturday afternoon (March 29). The five-year-old actress was joined by her on-screen mom from Good Luck Charlie, Leigh-Allyn Baker, plus Jessie‘s Skai Jackson and Cameron Boyce and Kickin It‘s Dylan Riley Snyder. Both Jessie and Good Luck Charlie were nominated for Favorite TV Show, but lost out to Sam & Cat. FYI: Dylan wore G-Star waistcoat and jeans.